While leaves can be composted, and green summer leaves usually are, large quantities of leaves resulting from the autumn fall presents a challenge calling for a different technique. Even a cool compost bin will generates heat, in part, due to the activity of bacteria breaking down its contents. The process of producing leafmould generally relies on fungal action rather than bacterial activity and occurs at lower temperatures so that while compost takes a few weeks or months depending on the process being used leafmould usually takes a year or two. The autumn leaves are an excellent source of carbon but are very slow to compost using conventional techniques. However, as leafmould they become excellent mulch and a key ingredient when making homemade potting and seed composts (See more information on the following page Compost Mixes ). Making your own potting mix is a personal contribution to saving peat bogs and reduces road miles by producing the product on site. Leaves can take a long time to compost. They are “Browns” being high in carbon, with a C/N ratio averaging at about 60 but ranging from 20-100. So if they are to be composted they will need to be accompanied by a good source of nitrogen to keep the balance in the bin. The amount of lignin, calcium and nitrogen in the leaves will also affect the time it takes for them to breakdown. In general as leaves take a long time to compost and have a tendency to mat, this may result in anaerobic fermentation. It has an earthy, dark brown texture and the smell will remind you of a woodland floor in spring or early summer. It can be used after a year, when the leaves are beginning to break down and the material is easily crumbled, as a soil improver or mulch around shrubs, and in ther flower or vegetable garden. It can also be used as a lawn top dressing in the Autumn. Some of the leaves can be bagged and saved for use as a source of browns when composting during the winter when there is less garden waste available and the main addition to the compost bin is kitchen food waste. The point of leafmould is that you use what you have. All leaves, including conifer needles, will eventually breakdown but some will do so more quickly than they will do others. Small quantities of the more awkward ones such as holly and other evergreens are best shredded and added to the compost bin. Faced with a large number of autumn leaves I would recommend making leafmould rather than compost keeping the holly and evergreens separate from deciduous leaves. Traditional leafmould was made by piling the leaves in a heap, and keeping it sufficiently wet to prevent them blowing all over the garden, or by imprisioning them within a wire netting cage. However we can now bag them or use a bin. Different leaves breakdown more slowly than others but no less an authority than the RHS makes it clear that all leaves including conifer needles will eventually break down into leafmould. The RHS divides leaves into the following groups. Oak, beech and hornbeam, break down easily to produce good quality leafmould. Leafmould made from oak and beech is good for use on acid loving plants. Thicker leaves such as sycamore, walnut, horse and sweet chestnut are slower to break down and benefit from being shredded before being used to make leafmould. These should also be shredded if they are to be composted. Evergreens such as holly, Aucuba and cherry laurel, are better shredded and composted. Conifer needles are slow to breakdown taking two to three years to decay but this can be reduced to a few months using a techniques described below. Conifer hedge clippings are better added to the compost heap than used for making leafmould. Some leaves such as acacia, camphor, California bay laurel, cypress, Eucalyptus, Juniper, pittsporum and walnut contain acids that are toxic to other plants and are best avoided. However it is said that they can be added if they only form a small proportion a small of the total. I would recommend gathering conifer needles separately as they produce an acidic product which is ideal for mulching ericaceous plants, such as rhododendrons, azaleas, camellias, Pieris and blueberries. If you have pine trees, your peak time for leaf drop will probably be the spring but can collect them throughout the year. We are using different methods of making leafmould at the Demonstration site including wire cages, plastic bins and bags. We are also using mixed leaves and bags of leaves from single trees for comparison as well as a mixuture of leaves from the lawn and grass from the final cut of the year. While a pile of leaves left in the corner of the garden will eventually be broken down by fungi to form leafmould a considerable proportion of them will be spread across the garden by the wind. To avoid this situation the leaves have traditionally been contained in a wire netting cage or wooden compost bin. For best results the pile should be checked during hot or dry periods and watered if necessary to keep leaves damp so that the moisture content high enough, Turning the pile occasionally to aerate it will also help. Plastic “cages” are also available but the simplest form of plastic container is a large plastic sack. The leaves are soaked; the rain will normally do this for you, and placed in a bag, which is then stabbed with a garden fork. The bags are left in a corner of the garden for two years and the leaves magically turn to a rich dark leafmould. I would recommend using old compost or rubble bags as the thin black plastic bag left in the garden is likely to become brittle and disintegrate before the leafmould is ready. 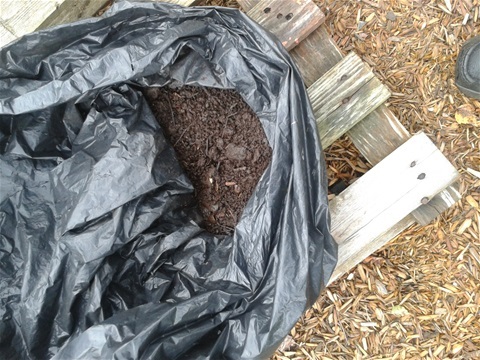 Second-hand builders' bulk bags can also be used to make leafmould they are permeable allowing excess moisture to drain away. Some people support the corners of the bag with stakes. The bag will be very heavy when filled so some cut the bottom out so that it can be lifted off the leafmould when it is ready others regard the bag as disposable and cut the front open to harvest the leafmould. Shredding the leaves using a garden vacuum, which includes a shredder, will reduce the size of the leaves and speed up the composting process. An alternative means of shredding is to spread the leaves on the lawn and mow them (and the grass). This provides a carbon (leaves) and nitrogen (grass) mix which further reduces the time taken to compost. Urine makes an effective accelerator and can be applied directly by men or for the more discretely collected indoors and taken to the bin or bag. One of the reasons that we normally make leafmould separately from compost is that the leaves are a Brown being high in carbon. 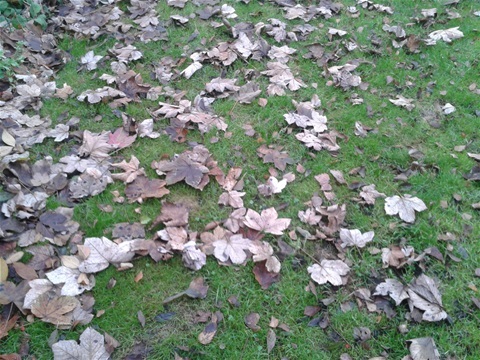 It is possible to speed up the decompostition process by adding, nitrogen rich, grass using the technique of shreddding the leaves by mowing them on the lawn which will speed up decomposition of the leaves. An altenative method of speeding up the process is, if you have access to a local coffee shop, restaurant or cafe, to add used coffee grounds to the leaves. Coffee grounds contain about 1.45% nitrogen making them a useful Green which can also be added to wormeries and the compost bin. Many coffee chains now bag and give away used grounds to composters. While some outlets might limit the number of bags each composter can take it is quite likley that an arrangement can be reached to have a regular bulk supply and a local independant outlet may be happy to have a source that will to take their whole supply. Comfrey can be used to make leafmould with additional nutrients. Comfrey is added to two year old leafmould two or three months before the nutrient enriched leafmould is to be used. This requires the leafmould to be transfered to a new container with a layer of comfrey leaves added every 10cm/4inches. Although it requires some effort it produces a relative consistant product. An easier method is to mix comfrey with the leaves as the leafmould bag or container is being filled in the autumn. All leaves are not the same and the type of leaf available may influence the choice of whether they are used to make leafmould or compost. Ash, cherry, linden, maple, popular and willow are categorised as “good leaves” by Ken Thompson in "Compost" composting down in about a year being relatively low in lignin and relatively high in nitrogen and calcium. He classifies beech, birch, oak and sweet chestnut as bad leaves being higher in lignin and lower in nitrogen and calcium and taking at least two years to compost. An alternative to adding the leaves to a compost bin is to make a leaf/grass sandwich using alternative layers of grass and leaves as if you were Grass Boarding substituting the leaves for the cardboard that would be used in a grass board heap. A variation on this technique is to use a mower to shred the leaves on the lawn when the grass need cutting so that there are about equal quantities of grass and shredded leaves. Compost made using Pine needles is acidic and as consequence their compost is recommended for acid-loving plants such as strawberries, raspberries, and rhododendrons. However the leaves take longer to decompose than most other types so should be composted separately. I would always recommend shredding them first. If you only have space for one compost bin pine needles can mixed with the normal compostable waste but I would recommend that they do not exceed 10 percent of the content. 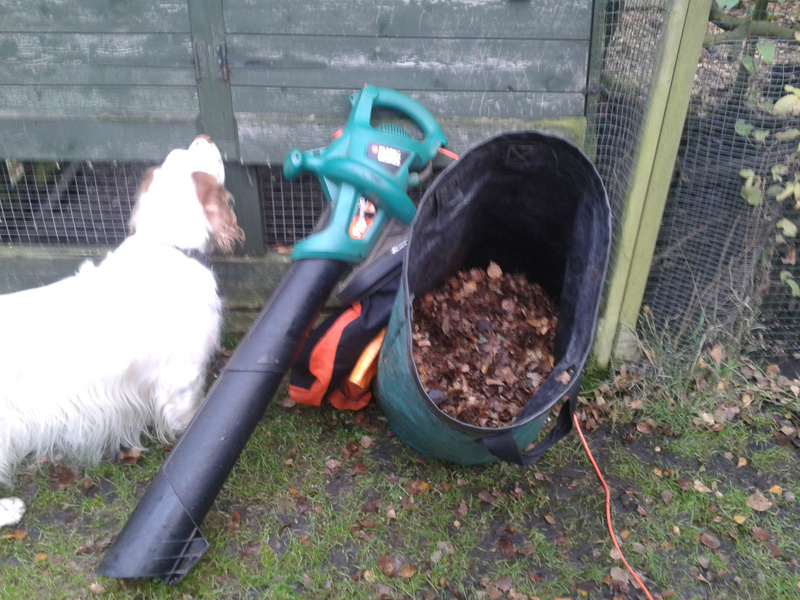 However the composting leaves in a conventional heap or bin can be a slow process. Hot composting using a Hotbin composter provides a quick and effective means of composting shredded Leylandii and pine needles producing compost in about 3 months if the temperature is maintained. Alicia Bodine in a Home Guide by Demand Media recommends the following composting method. Starting with an empty compost bin fill approximately 8 inches grass clippings, or any other green waste from plants in the garden. Water until moist but not sopping wet. Add a 3-inch layer of pine needles, repeat the watering and then add a 1 inch layer of horse, cow or chicken manure. Water again. This layering of grass, pine needles and manure is repeated until the bin is full. The bin should be watered to keep it moist and the compost mixed to aerate it once every two weeks. The compost should be ready for use in about two to four months. There is a variation on making leaf mould using plastic sacks this involves adding the contents of the Bokashi bin to the plastic leaf mould sack containing dry leaves during the winter months. This is reported to produce leaf compost during the coming spring and summer. I have not tried this but further details are on Jenny`s Bokashi Blog. This will produce a mulch for use early in the season or a more useful compost mix after a later in the summer. At this stage, the bags can be stabbed with a fork to create air holes and entry points for worms. These holes will also provide drainage. The Horse chestnut leaf miner (Cameraria ohridella) is an exotic insect pest that lives in horse chestnut trees. The larvae (caterpillars) mine within the leaves. Although it can cause severe damage to horse chestnut leaves on an annual basis, and discolouration and defoliation before normal autumn leaf-fall. The pest does not significantly impair trees' health, and they will usually flush normally the following spring. The Forestry Commission recommended treatment consists of removing fallen leaves during the autumn and winter and either send them to be commercialy composted, or hot composting at home. This will destroy the over-wintering pupae. 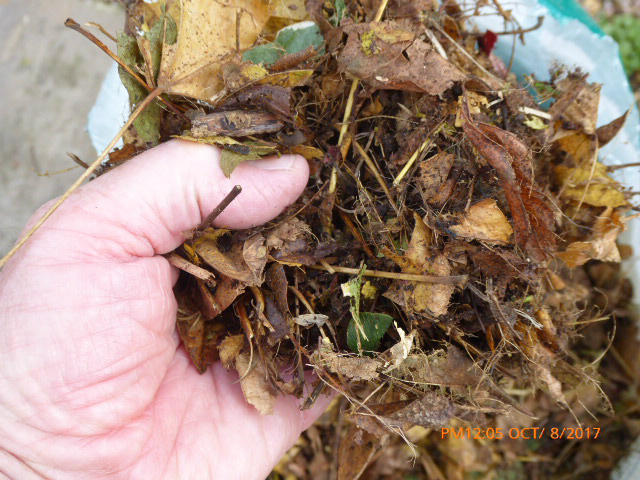 Cool composting (or making leafmould) is less effective control measure when leaves are collected into smaller heaps and not turned regularly, as the temperature will not reach the level necessary to kill the pupae. However covering the leaves with a 10cm layer of soil or 15-30cm layer of other plant material until the end of May, will prevent adult emergence in the spring and will help to reduce damage. 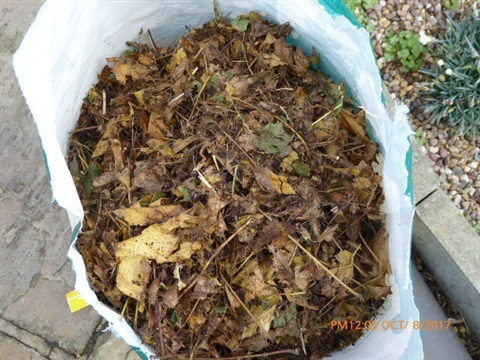 Bagging the leaves for two years when making leafmould then covering the bag with a layer of soil and not opening the bag until after May of the second year should be even more effective. At present most of the outbreaks of ash dieback disease in Britain are in East Anglia and Kent, although a small number of outlying cases have been confirmed in northeast England and Scotland. The common ash (Fraxinus excelsior) is the most frequently affected species but Fraxinus angustifolia is also highly susceptible. This information and advice is taken from the Forestry Commission (http://www.forestry.gov.uk/pdf/FCPH-ADD.pdf/$FILE/FCPH-ADD.pdf). The leaves typically show wilting and black-brownish discoloration that extends into the midrib and leaf stalk. Where leaves affected by the disease require disposal, the preferred way to reduce the rate of spread of the infection is by using on-site disposal options and not move the leaves to another. In addition, gardeners should not collect dead leaf litter from elsewhere. Spores can be transmitted via infected dead leaves and this could infect new areas. Local authorities should advise householders not to put out green waste suspected of being affected by Chalara, but to deal with it within the grounds of their own premises, in all but exceptional cases. Depending on the nature and location of any infected leaves the following options are suggested by the Forestry Commission in decreasing order of preference. (a) Burning on site on the ground or incinerators brought t where allowed under legislation on smoke control areas. (b) Burial in the ground by local authorities would constitute a landfill operation and requires an environmental permit which fulfils the requirements of the Landfill Directive. However, individuals acting in a private capacity are not subject to the same requirements so householders may bury affected leaves within the grounds of their premises if they wish. (c) Composting on site. There is no clear scientific evidence available on the effectiveness of composting as a treatment. Composting is less effective when leaves are collected into smaller heaps and gardens, because temperatures in small heaps are too low to kill spores. Hot Composting should be effective. If cold composting covering the leaves with a 10cm layer of soil or 15-30cm layer of other plant material, and leaving the heaps undisturbed for a year (other than covering with more material) is likely to prevent any spore dispersal. Bagging and leaving for two years to make leafmould should be even better. Any leaves which are not destroyed or otherwise processed (e.g. through composting) can be used for mulching or on allotments only in areas where the disease is already present. Given the uncertainties mentioned above, wherever possible any resulting compost should be spread on or near the infected source and not passed on to third parties who might move it off site.